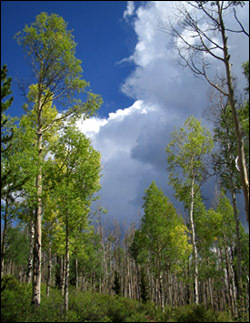 On the edge of the Buffalo Peaks Wilderness Area south of Fairplay, Colo. in the Pike National Forest, the Lynch Creek Trailhead accesses a long, approximately 12-mile loop trail. Not far from the trailhead (found by taking Forest Road 431 to its terminus from U.S. 285), the hiker faces a choice: take a left and enter the Buffalo Peaks Wilderness Area along the Tumble Creek trail, or go right and trek east and north through a verdant and scenic slice of the Pike National Forest to the Rich Creek Trailhead. Initially, we followed the Tumble Creek Trail, which hugs the raucous Rough & Tumbling Creek up through the forest. However, after following what appeared to be a deer trail on the south side of the creek, the trail seemed to dissolve along the mossy banks of the loud stream and we didn’t reach our destination, Buffalo Meadows (marked by a sign as 3 miles from the start of Tumble Creek Trail). Both a topographic map of the area and the Pike National Forest map indicate that the Tumble Creek Trail crosses Rough & Tumbling Creek, but we didn’t find the crossing. On another day, we opted for the alternate route from Lynch Creek Trailhead, destination: the Rich Creek Trailhead. Following Salt Creek Trail 618 from the Lynch Creek trailhead for about 1 mile takes one to the crossroads of the loop. The trail from the Lynch Creek portal dives into the thick spruce and aspen forest, pungent on this day in late August from recent rains. Our arrival at the trailhead was preceded by a group of equestrians, who quickly trotted ahead. The trail soon offered glimpses out to the forested hills and valleys to the north, with large aspen groves sprinkled throughout. The lush understory of the forest, punctuated by wildflowers, reflected the wet summer. Beaver ponds dot the right side of the trail. Once at the loop crossroads for the second time in a month, we took the Rich Creek route this time, following a sign noting the 3-mile distance to the Rich Creek Trailhead. (A hard right from the junction takes one along a path following the southern edge of Rough & Tumbling Creek.) Crossing the creek, we then took the left fork in the trail which rose up above the water through an aspen grove with dozens of young, small aspen. 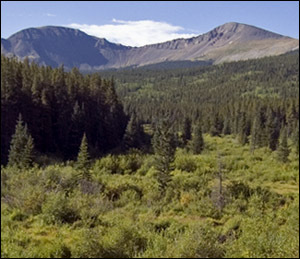 This section of the Pike National Forest is extremely lush, with copious amount of grasses and shrubs lining the creeks and its tributaries, forming a large wetlands area. The signature Buffalo Peaks are upstream. 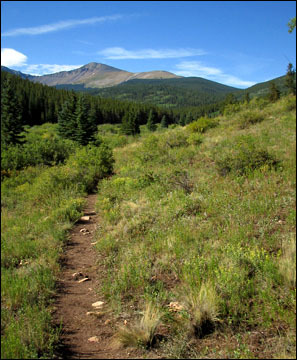 The trail stays within listening distance of Rough & Tumbling Creek for a short period, rolling gently up in elevation. It then leads the hiker out of the forest and into an open stretch along the creek and wetlands. About 1 mile into the trail, the path takes a sharp left up into the forest. Clouds were quickly moving this late summer morning and the first rumbles of thunder crackled from the distance. Surprisingly, a few aspens along the way were already beginning to turn color, a little early it seemed, but signaling the coming turn to gold. The easy trail rolls through the forest, moving slowly and steadily uphill. Soon the trail heads downward on a narrow path lined with moss through spruce trees. Not long thereafter, the sound of a creek below marks the end of this section of the loop. Suddenly, trail meets creek. The area around Rich Creek Trailhead seemed crowded, contrasting with the quite solitude of the trail, so we quickly turned around and headed back to the Lynch Creek Trailhead 3 miles south. While out-and-back hikes are shunned by some, we often find the return trip on these hikes affords views of previously unseen panoramas and details, offering a fresh perspective of an area. Such is the case with this trail, which, once returning the the banks of the wetlands, offers great views of the green valley and hillsides leading up to the twin Buffalo Peaks. We will be back another time to attempt the clockwise traverse of the loop, as access to the Lynch Creek Trailhead is very easy via the well-maintained Forest Road 431 from U.S. 285. Numerous rough campsites dot FR 431 and the more developed Buffalo Springs national forest campground, while within earshot of U.S. 285 traffic, offers several campsites worth visiting and pitching a tent.